The Premier P218X Polyboard guillotine paper cutter is a high quality trimmer for use in a small office, home office or for craft projects. The P218X is part of the Martin Yale Premier line of PolyBoard series of trimmers which have bases made out of unbreakable poly material. In fact, the durable construction of these trimmers allows Martin Yale to offer a lifetime warranty on the P218X. In fact, the warranty even covers the blades of the cutter. This cutter is durable, sharp and easy to use. Consider adding a Premier P218x cutter to your office today. Dimensions: 14" x 26" x 3"
I'm glad that I bought the Premier P213X Polyboard 18 Inch Guillotine Paper Cutter because it is very sharp and very reliable. I use it most often to cut along grid lines on single sheets of graph paper. Now I'm able to match each grid line accurately to those on the next page (which I tape in place). The Polyboard base is light which makes the device easy to move from one room to another. The handle lock feature is easy to use too. My needs are simple and this works well for me. Welcome to MyBinding video. 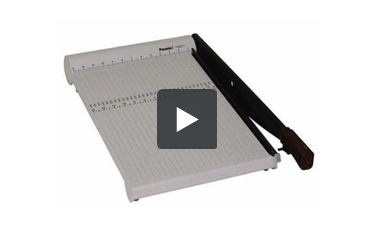 This is a look at the Premier P218X polyboard 18-inch guillotine paper cutter by Martin Yale. Lightweight, easy to use, and very precise, the P218X is a great buy. Line everything up according to the measurements on the grid, release the safety lock with just the finger. Line everything up in place and make your cut. The P218X makes the claim of cutting up to ten sheets of 20lb paper per trim. This is actually not true. We were able to easily do ten sheets as well as 15 and more. And one of the greatest selling points of these Premier polyboard cutters is that they are so lightweight, easily moved and stored. For more demos, reviews, and how to's of this product and many more, check out MyBinding.com. Martin Yale makes paper cutters that are ideal for a variety of environments, including offices and schools. One that’s just right for the classroom and workplace is the Premier P218X. Here’s everything you need to know about it. The P218X can only cut 10 sheets at a time. This cutting capacity will be fine if you plan on using this trimmer for smaller jobs. However, it simply won’t cut it (no pun intended) if you need to cut a lot of paper often. While you could use it for larger jobs, it will take up a lot of time which isn’t great if you’re in a hurray. This cutter can trim paper that’s up to 18 inches long. This is the ideal cutting length: it’s not too big and not too small. You’ll be able to use this trimmer to cut both letter- and legal-sized sheets, as well as tabloid-sized paper. All in all, this is a great cutting length. The P218X is made from really durable materials. The base is made out of polyboard, which is a type of unbreakable plastic. The blade is honed from stainless steel and is self-sharping for easy maintenance. Because this device is made from such great materials, you can expect to get a lot of use out of it. If you want to use a cutter that’s very safe, the P218X would be a great choice. This trimmer’s blade is spring-loaded so it won’t fly up without warning. (It won’t come crashing down either.) Every time you lower the blade, it will latch so it csn stray down. This helps prevent someone from accidentally touching the edge of the blade. There’s also a full-length finger guard that further prevents injury. The P218X’s base has an alignment grid as well as metric and standard rulers so you so you can easily measure your paper before cutting it. (There are actually two standard rulers. One is at the top and the other is located right in the middle of the base.) This device lacks more specialized cutting guides, which is disappointing. This cutter has dimensions of 14” (width) x 26” (depth) x 3” (height). You should be able to find room for it quite easily. However, you might have trouble using larger sheets of paper with this device since it’s not very wide. The P218X comes with a terrific limited lifetime warranty that even covers the blade. The Premier P218X is a basic guillotine paper cutter and it would be a good choice for offices and schools that are looking for something durable and safe to use. With a polyboard base and stainless steel blade, you’ll be able to get a lot of use out of this product for a long time. The only real disadvantage to using this device is the cutting capacity. It’s not fit for heavy-duty use and even if you tried to use it for big cutting jobs, it would get really tedious in a hurry. However, if the cutting capacity is fine with ou, be sure to check out the P218X today so you can decide if it’s right for your needs.